There has been a steady chatter about a no-fly zone over Syria. The concept is to limit Assad and Putin from attacking pro-Western fighters who oppose both Assad and ISIS. There now is a No-Fly Zone over Syria – only it’s Putin’s No-Fly Zone and it’s the NATO planes that dare not fly for fear of Putin’s newly install S-400 anti-aircraft missile batteries installed in the Russian occupied portion of Syria. These missiles can attack multiple targets up to a 200 mile range. Obama pulled US Patriot anti-missile anti-aircraft batteries out of Turkey just before the Russians moved in. Certainly sends a clear message of our resolve to support our NATO “FRIENDS” doesn’t it! Then again, it’s totally consistent with Obama’s lack of support for our friends the Ukrainians. Reminiscent of advice from Mom: If you want to have a friend, you have to be a friend! 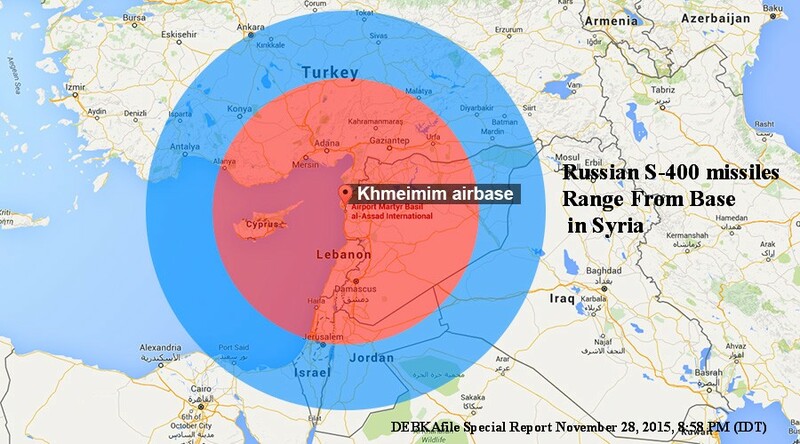 The deployment of the highly advanced Russian S-400 anti-air missiles at the Khmeimin base, Russia’s military enclave in Syria near Latakia, combined with Russia electronic jamming and other electronic warfare equipment, has effectively transformed most of Syria into a no-fly zone under Russian control. Moscow deployed the missiles last Wednesday, Nov. 25, the day after Turkish warplanes downed a Russian Su-24. Since then, the US and Turkey have suspended their air strikes over Syria, including bombardments of Islamic State targets. The attacks on ISIS in Iraq continue without interruption. Turkey is now extra-careful to avoid flights anywhere near the Syrian border. Both the US and Turkey are obviously wary of risking their planes being shot down by the S-400, so long as Russian-Turkish tensions run high over the Su-24 incident. However, DEBKAfile’s military sources confirm that neither the US, Turkey or Israel have any real experience in contending with the Russian S-400, which uses multiple missile variants to shoot down stealth aircraft, UAVs, cruise missiles and sub-strategic ballistic missiles. Its operational range for aerodynamic targets is about 250 km and for ballistic targets 60 km. The S-400 can engage up to 36 targets simultaneously. Thei range covers at least three-quarters of Syrian territory, a huge part of Turkey, all of Lebanon, Cyprus and half of Israel. Since the downing of their warplane, the Russians have put in place additionally new electronic warfare multifunctional systems both airborne and on the ground to disrupt Turkish flights and forces, Lt. Gen. Evgeny Buzhinksy revealed Friday. Turkey has countered by installing the KORAL electronic jamming system along its southern border with Syria. An electronic battlefield has spread over northern Syria and southern Turkey, with the Russian and Turks endeavoring to jam each other’s radar and disrupt their missiles. In this, the Russians have the advantage. With the Americans, Russians and Turks locked in a contest over Syria, and the Israeli Air Force’s freedom of action restricted by objective conditions, some comments made at week’s end by Israeli military and security officials sounded beside the point. Who Are The Real Syrian Refugees? 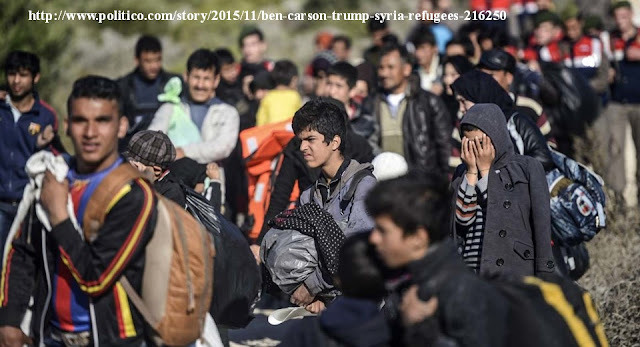 The media is awash with well-meaning stories of the women and children Syrian Refugees and their plight and flight. As one watches the TV coverage of the massive flow of humanity, one starts to wonder about the claim that they are mostly women and children. On the contrary, one sees mostly men who appear to be young, healthy and adequately dressed. This raises the key question: why are these men not fighting to free their country from Assad and ISIS? Did we not have a $500 million project to help them develop and expand the “freedom fighters” that Obama said would be the “boots on the ground” that we would support with training, equipment and air-support? 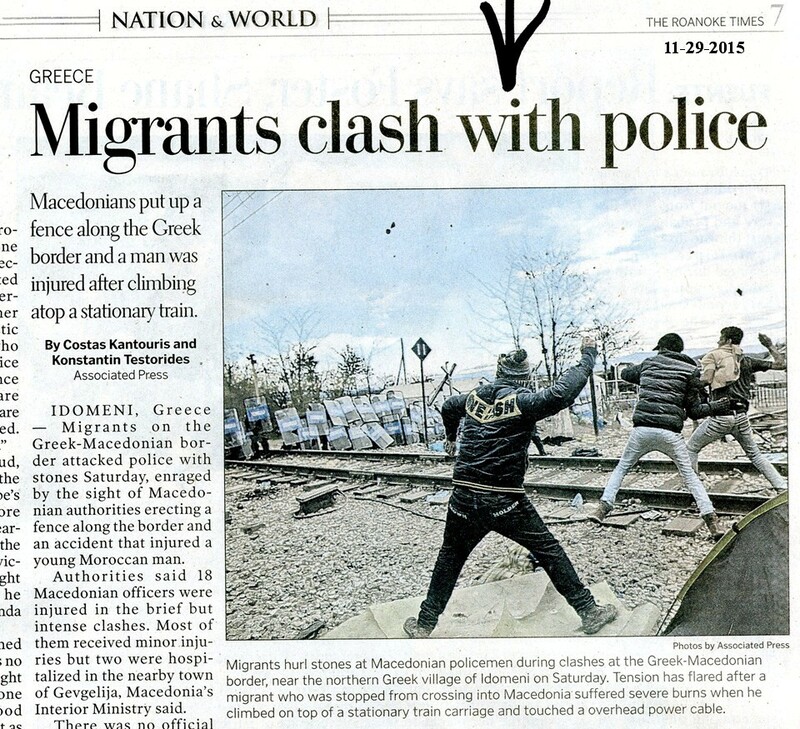 The Most Basic Instincts: Syrians Fight Or Flight? There is more to this “who are the real Syrian refugees” than Obama, his minions and his Pravda Press are presenting to the public. Roanoke Times, 11-29-2015, Multiple big articles in multiple sections on multiple pages on why we all need to get behind Obama’s Global Warming Jihad and give the rest of the world hundreds of Billions of dollars (ultimately Trillions of dollars) in reparations for destroying the world as we know it. We also must destroy our current energy infrastructure systems and build wind turbines for the times when the wind blows and solar panels for the times when the sun shines. There is less than one degree global warming in past 250 years. The less than one degree warming cannot be shown by Real Science to be man-caused. For billions of years there’s only been one driver of world temperature – Mother Nature! The less than one degree warming is a natural extension of the natural global warming that ended the Little Ice Age, circa 1750 to 1800, a blink of Mother Nature’s eye ago. There has been no significant global temperature change in last 18 years. The taxpayer funded global warming models are belied by real measured data, something about garbage in = garbage out. The Gore-Mann Hockey Stick has been totally falsified by measured data. The non-US countries are burning more fossil fuels than the US. A beam of light amongst the Roanoke Times fog and smoke of AGW is on Pg 3: by Bob Gibson: Virginia’s coast is sinking! 11-12-2015: Mother Natures Weather And Climate --- includes the latest NASA data that the Antarctic Ice is growing and therefore is not having any significant impact on rising sea levels that have been in process for over 16,000 years. GEOLOGY | New research confirms that the land under the Chesapeake Bay is sinking rapidly and projects that Washington, D.C., could drop by six or more inches in the next century—adding to the problems of sea-level rise. This falling land will exacerbate the flooding that the nation’s capital faces from rising ocean waters due to a warming climate and melting ice sheets—accelerating the threat to the region’s monuments, roads, wildlife refuges, and military installations. For sixty years, tide gauges have shown that sea level in the Chesapeake is rising at twice the global average rate and faster than elsewhere on the East Coast. And geologists have hypothesized for several decades that land in this area, pushed up by the weight of a pre-historic ice sheet to the north, has been settling back down since the ice melted. It’s very unsettling to realize that a pseudo-Kenyan, pseudo-Muslim, Chicago Street Organizer is telling the people of the world, in the face of massive contrarian factual data, that “we” have destroyed the earth’s ecosystems and we’re going to give “you” massive reparations for our “sins”! We are so sorry that we are responsible for Typhoons, Hurricanes, sand storms, rising oceans, floods, starvation, pandemics and parched deserts and we hope you will forgive us when you cash the big checks that we are bringing to Paris next week as an initial down-payment! 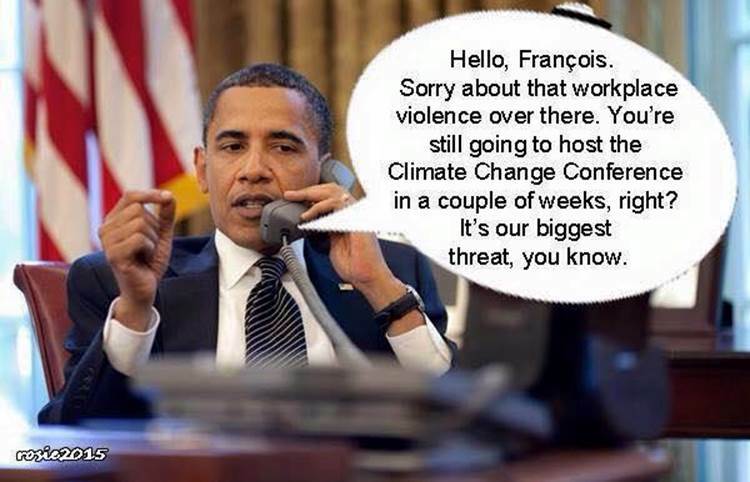 We (both Obama and Kerry) have publically acknowledged that the Radical Muslim Terrorist and Refugee disasters now underway are directly caused by man-made global warming that Americans have caused. All we can do now is PAY and PRAY for forgiveness and absolution. Perhaps the Pope will help us if we present these reparations as Indulgences. "Let the lie come into the world, let it even triumph, but not through me". It’s interesting that most states have laws making it illegal for anyone to wear a mask that conceals their identity. 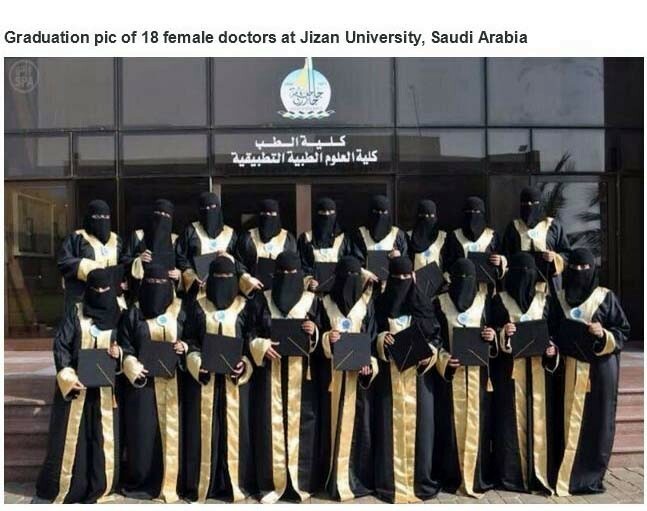 Now we have a whole class of people who conceal their identity claiming that their women wear masks (burkas) for religious reasons. When one wears a burka it’s not clear who the person is or even if it’s a man or woman and the garb can well conceal dangerous contraband. In the US it appears most states have waived their anti-mask laws for burkas even to the extent of allowing persons to wear burkas for drivers licenses. How totally bizarre is that! Muslim women can no longer wear the full-body garment in shops, restaurants or public buildings and anyone caught flouting the ban could be struck with a £6,500 fine. The local government of Ticino approved the referendum after the Swiss Parliament ruled that the ban did not violate the country's federal law. Two in three voters in the canton backed the move in an overwhelming result for a referendum, in the wake of heightened terrorist alerts across Europe. Has anyone ever labeled the Swiss as radical, islamophobic or mean-spirited? Perhaps they are coming to grips with the new reality of Radical Muslim Terrorism that our leadership, media and do-gooders cannot comprehend or will not acknowledge. How sad is that! Who was that masked surgeon that operated on me? A somber thought at this special time is that Obama and the Progressive and Liberal elements in our country are working diligently to reeducate our people that this country never was a Christian Nation founded on Christian values. Roanoke Times, 11-25-2015, Pg 1, 8: McAuliffe says he’ll veto anti-refugee initiatives. Then goes on to say he doesn’t have any say or control or influence on the subject! Goes on to say: “I’m trying to be a job creator and a problem solver”! 4.2 % is representative of our economic status. Really? It’s the same song Obama sings and The Pravda Press provides the music. Look-up the data and draw your own conclusions as to how well McAuliffe and associates are handling “job creation” and retention and the economic health of Virginia. RT, 11-25-2015, Pg Bus. 10: Consumers far less confident in November! Perhaps they’re starting to check-out the Cool-Aide before they drink it! Turkey’s shoot down of one of Putin’s combat aircraft was far more about who the Russians were bombing rather than the incursion into Turkey’s airspace. The Russians were bombing Turkey-friendly forces in Syria that are fighting to depose Assad. Putin has vowed to support Assad and is doing so with massive bombing runs. Those bombs also target anti-Assad forces that are US-supported; however, we haven’t done anything to support our friendly-forces! Nicely consistent with our non-support for our friends the Ukrainians! Just more hope and change our “friends” can depend on! Who in their right mind would want to join an Obama coalition team-effort? Russia ramped up the threat of a military confrontation between Turkey and Moscow Wednesday – a day after a Russian warplane was shot down by Turkey – by announcing that a state-of-the-art air defense missile system will be deployed at a Russian air base in Syria and that all its bombers will now be escorted by fighter jets on their missions. Obama removed our Patriot anti-aircraft anti-missile units from Turkey. How is that consistent with supporting a fellow NATO partner? Little wonder Israel has their own "Iron Dome"! How much money does the US give the UN? No one really knows! That’s because multiple US Departments make major contributions and no one adds it all up! Rather like WaterGate: You don’t know and you don’t want to know! 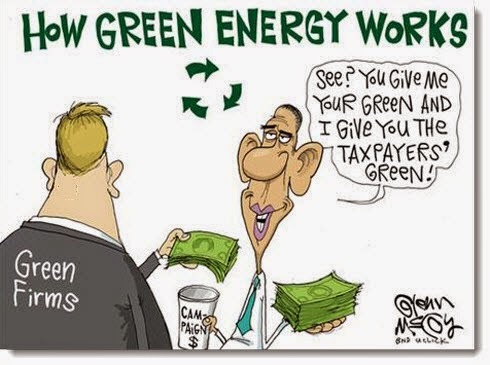 The Obama proposed “Green Climate Fund” is based on US reparations to the world because “we” destroyed the world’s environment by burning fossil fuels! This is based on the totally discredited Gore-Mann Hockey Stick that was the basis for his “Inconvenient Truth” that has been belied by none other than Mother Nature! The warming is an extension of the natural global warming that ended the Little Ice Age circa 1750 to 1800. The taxpayer funded global warming models are totally belied by real measured data. Why should the US taxpayers put $500 Million MORE money into the hands of the UN’s bureaucrats?